Here's your new best friend! This bulldog puppy (who has been raised as a French poodle) has a sweet smile and bright pink bowtie. 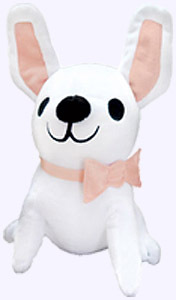 With ultra-soft white plush and lovable round eyes, this is one puppy that is hard to put down! 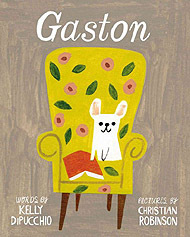 An impossibly cute book now has its equally adorable plush counterpart in Gaston. This is the story of four puppies: Fi-Fi, Foo-Foo, Ooh-La-La, and Gaston. Gaston works the hardest at his lessons on how to be a proper pooch. He sips - never slobbers! He yips - never yaps! And he walks with grace - never races! Gaston fits right in with his poodle sisters. But a chance encounter with a bulldog family in the park � Rocky, Ricky, Bruno, and Antoinette - reveals there�s been a mix-up, and so Gaston and Antoinette switch places. The new families look right�but they don�t feel right. Can these puppies follow their noses - and their hearts - to find where they belong? Author Kelly DiPucchio. Illustrator Christian Robinson. Ages 4 - 8. 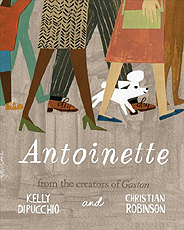 Antoinette - a very special poodle - learns to follow her heart and be herself in this charming companion to Gaston. Antoinette's three burly brothers each have a special talent. Rocky is clever. Ricky is fast! And Bruno is STRONG. Mrs. Bulldog reassures Antoinette that there is something extra special about her - but Antoinette is not so sure. Then one day, while Antoinette plays in the park with her friend Gaston, Gaston's sister Ooh-La-La goes missing. Antoinette feels a tug in her heart and a twitch in her nose. She must find Ooh-La-La. She will not give up! Can Antoinette rescue the puppy in peril - and discover what makes her extra special along the way? Author Kelly DiPucchio. Illustrator Christian Robinson.